To live an unforgettable holiday on the Island of Elba! Come and visit us in Procchio! 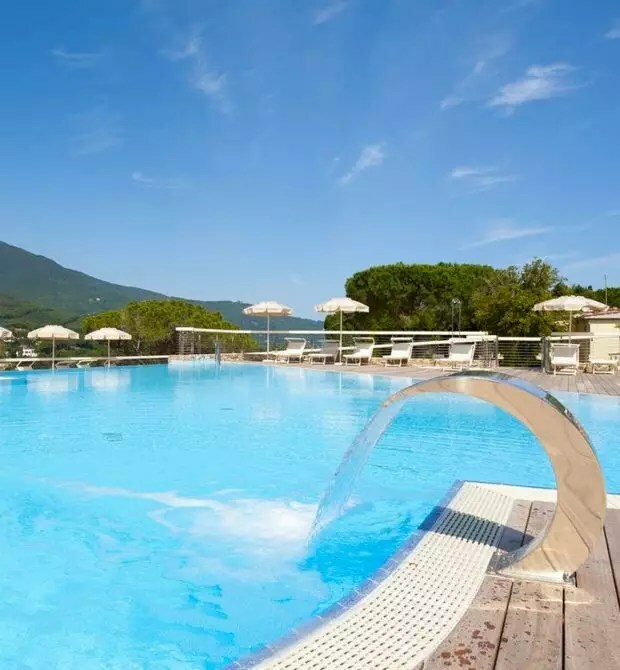 Surrounded by the scents and colors of the Mediterranean bush, Hotel La Perla del Golfo enjoys a magnificent location overlooking the Gulf of Procchio, along the provincial road leading to the small town. Our 4-star hotel offers different types of rooms, all entirely renovated and equipped with the same comforts. Some rooms are located in the grove of oaks behind the hotel and connected to the main building by a lift, all with an independent patio and entrance. The Hotel takes particular care of services for children, starting from the restaurant to the mini-club with animation. These characteristics make Hotel Perla del Golfo a particularly suitable venue for families and others (see the price list to discover our special conditions!). Save with Perla del Golfo, book one of our packages on offer: come and visit us on the Island of Elba! Perla del Golfo at your service! The hotel has a completely new swimming pool from which you can enjoy, in total relaxation, a unique setting. For children, there is a playground where they can spend their time in the open air with our highly qualified animation, which will involve them in recreational activities in maximum safety. In the evening, children can dine on the terrace with the animators. Pearl of the Gulf will welcome you with the availability and friendliness of our staff! Our restaurant, supervised by the talented Chef Claudio, is always ready to satisfy even the most refined palates. Maitre Giuseppe will be at your disposal to guide you in the choice of dishes that will be proposed, while in the evening you can enjoy a drink at the American bar prepared by Biagio. Our regular customers appreciate us for the great availability, but above all for the excellent gastronomy that offers the most refined and genuine in the Tuscan and Mediterranean cuisine. Immerse yourself in an exclusive context, enjoy a wonderful sea, in contact with nature!